Metrotube (public beta) is a YouTube application designed specifically for Windows 8. It allows you to access all of YouTube's content through their app. Availble free in the Windows store. Flipboard (updated) gathers articles and news sources from around the web to create a magazine tailored to your interests. The newest update allows you to create a custom magazine about a topic and share it with friends. Supports iOS and Android. MacType (4.7 MB) allows font rendering in Windows and will also convert vector fonts into rasterized bitmap fonts. Features include a System tray icon, a Wizard-type interface, etc. Freeware for all Windows. DarkWave Studio 4.1 (0.16 MB) is a digital, open-source audio workstation for Windows. Features include a modular Virtual Studio, Pattern Editor, Sequence Editor; x64 and x86 Windows platform support, VST plugIn support, etc. Freeware for Windows XP/ Vista/ 7/ 8. Ashampoo Burning Studio Free 6.8 (1.1 MB) is a full featured CD/DVD/Blu-Ray burning suite. Features include an integrated audio CD ripper, multi-disc file backup, etc. Freeware for Windows 2K/ XP/ Vista/ 7. John's Background Switcher 4.5 (255 KB) lets you automatically switch your desktop wallpaper using various image sites. Simply choose how often images rotate using images from your MyPictures folder, Flickr and Facebook accounts, Picasa Web Album and Webshots, etc. Freeware for all Windows. 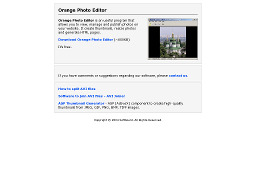 Orange Photo Editor (576 KB) allows you to view, manage and publish photos on your website. It can create thumbnails, resize photos and generate HTML pages. Freeware for Windows 98/ ME/ XP/ NT4.x/ 2000. Juice 2.2 (6.6 MB) is a podcast player/manager that lets you download podcasts for iPods, media players or computers. Supports 15+ languages and multiple media players. Has a built-in directory with 1000's of podcast feeds. Freeware for Windows 2000/XP/Linux and OS X 10.3+. 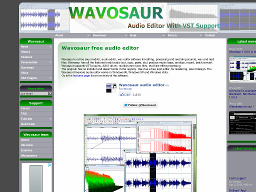 Wavosaur 1.0.0.6 beta (136 KB) is a powerful audio editor, ideal for editing audio clips, sound designing, mastering, and audio recording. Also a VST host, meaning you can use VST effects on your recordings. MIDI controllable. Freeware for Windows XP. 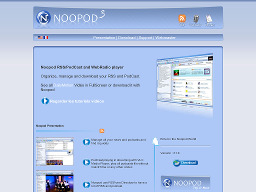 Noopod 3.0.1 (14.6 MB) is a RSS, PodCast, WebRadio, WebTV and Daily Motion video player. Slick application that integrates a number of different mediums into one player. Freeware for Windows 2000/ XP/ Vista. Debut 1.1 (390 KB) is an easy-to-use video recorder that can capture video files directly from your PC using a webcam, or other input source. Can also record screen captures. Records in .avi, .wmv or .asf formats. Other features include automatically emailing recordings and specifying recording times. Freeware for Windows 98/ 2000/ XP/ 2003/ Vista. 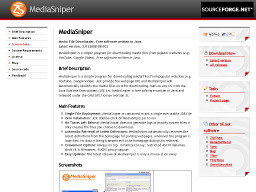 MediaSniper 2.0 (124 KB) is a simple program for downloading media files from popular sites like YouTube, Google Video etc. 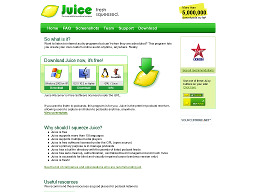 Freeware for any OS with Java Runtime Environment (JRE 6+). Does not generate logs or modify system files. Minimizes to system tray. DP Animation Maker (10.6 MB) is animation software that allows you to create animated images. You can create backgrounds, animated gifs for websites, etc. It comes with tools that will help you turn almost any picture into animation. Supports GIF, AVI, and EXE formats. Freeware for Windows. Free YouTube Download 2.2 (5.8 MB) allows you to download videos from YouTube and Google Video individually or in batch mode and save them as AVI, MP4, 3GP OR FLV files. Great for adding videos to your own site. Freeware for Windows 95/ 98/ ME/ XP/ 2000/ 2003.